Difference between revisions of "Pantheon"
[https://bbs.archlinux.org/viewtopic.php?id=152930 Pantheon] is the default desktop environment originally created for the [http://elementary.io/ elementary OS] distribution. It is written from scratch in [[Wikipedia:Vala (programming language)|Vala]], using [[GTK+|GTK3]] and [https://valadoc.org/granite/index.htm Granite]. With regards to usability and appearance, the desktop has some similarities with [[GNOME Shell]] and [[Wikipedia:MacOS|macOS]]. [https://bbs.archlinux.org/viewtopic.php?id=152930 Pantheon] is the default desktop environment originally created for the [http://elementary.io/ elementary OS] distribution. It is written from scratch in [[Wikipedia:Vala (programming language)|Vala]], using [[GTK+|GTK3]] and [https://github.com/elementary/granite Granite]. With regards to usability and appearance, the desktop has some similarities with [[GNOME Shell]] and [[Wikipedia:MacOS|macOS]]. Pantheon is the default desktop environment originally created for the elementary OS distribution. It is written from scratch in Vala, using GTK3 and Granite. With regards to usability and appearance, the desktop has some similarities with GNOME Shell and macOS. Although the elementary OS release schedule and toolchain are bound to Ubuntu's LTS release cycle, development moves quickly and has recently moved to github. Warning: The pantheon repository is no more, from now on pantheon packages will be available in the extra-alucryd repository, and they will be signed. The PKGBUILDs for the pantheon packages are also available in the AUR. cerbere-gitAUR: Watchdog service; restarts core components if they crash. pantheon-applications-menu-gitAUR: Application launcher formerly known as "Slingshot"
pantheon-code or pantheon-code-gitAUR: Text editor formerly known as "Scratch"
pantheon-music or pantheon-music-gitAUR: Audio player formerly known as "Noise"
pantheon-videos or pantheon-videos-gitAUR: Video player formerly known as "Audience"
pantheon-session-gitAUR provides a gnome-session entry for display managers such as gdm or lightdm. Pantheon is a gnome-session, and as such implements XDG Autostart. Alternatively, you can use ~/.xinitrc to launch the Pantheon shell, by adding exec cerbere to the end of the file. Add it to your ~/.xinitrc Shell script, before the exec cerbere line. Add it to the dconf key org.pantheon.desktop.cerbere.monitored-processes. Should the process stop, cerbereAUR will respawn it. Use a program like dapperAUR, dex-gitAUR, or fbautostartAUR to implement XDG Autostart. Configure Pantheon via switchboardAUR or switchboard-gitAUR and its plugs (switchboard-plug-*), which must be installed separately. Not all of gnome-control-center's settings panels have been ported. In addition, except plank, all the Pantheon components store their configuration in the org.pantheon or io.elementary gsettings keys, which can be edited with dconf-editor. Note: switchboard-plug-elementary-tweaks-gitAUR provides easy access to customizations for various aspects of the Pantheon desktop and applications, similar to gnome-tweaks. Wingpanel does not come with any indicators; they must be installed separately. Note: wingpanelAUR supports Ayatana indicators, while wingpanel-gitAUR has native indicators (wingpanel-indicator-*-git). If launched by ~/.xinitrc, add third-party indicators to one of the start-up methods described above. Ayatana Indicators require wingpanel-indicator-ayatanaAUR or wingpanel-indicator-ayatana-gitAUR to appear in wingpanel-gitAUR. indicator-sessionAUR relies on dbus methods provided by Unity for most of its functions and fails to fallback to gnome or systemd methods in its absence. wingpanel-indicator-session-gitAUR needs light-locker or xscreensaver-dbus-screenlockAUR installed for the Lock menu item. Either drag and drop a desktop file on to the dock, or right click on a running application and select "Keep in dock". You can then reorder icons by drag and drop. If you want to enable context menu entries such as for file-roller to extract/compress archives, then you have to additionally install contractor or contractor-gitAUR. To make pantheon-terminal (semi-)transparent, set the dconf key org.pantheon.terminal.settings.opacity to your desired opacity; for pantheon-terminal-gitAUR, the background color and transparency are set by io.elementary.terminal.settings.background. Wingpanel is transparent by design when using gtk-theme-elementaryAUR or gtk-theme-elementary-gitAUR, and becomes opaque when a maximized window occupies your screen. 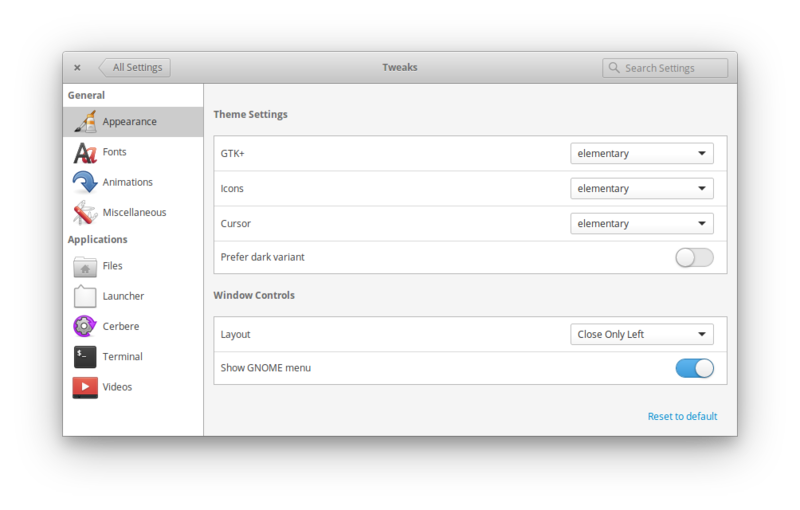 However, using other GTK themes will produce a solid panel most of the time.